Fishing is a process to catch fish through gears. It is an adventurous approach that brings a feeling of excitement to get a beautiful catch. Besides professional fishers, fishing enthusiasts also enjoy it as a sports activity to refresh themselves. Along with rod and reel, a fishing shirt is also an essential accessory for the sports fishing. Best fishing shirts perform the job of protecting yourself from the sun while fishing and give you proper style while reeling in the fish. A fishing shirt is your best fishing buddy which is comfortable and protective even in harsh condition and always make you ready for any fishing trip. Moreover, regarding performance and quality, fishing attires are functional and stylish too. If you are wondering about the difference between a fishing shirt and other shirts, have a look here to know what makes them good and what makes them the best of the best. Two primary materials such as- Nylon and Polyester fabrics are used in making fishing shirts. These synthetic materials over the fishing shirts have such great properties to protect you from sun, bug, and brush as well. Again, these shirts provide enough ventilation and comfort to keep you dry and fresh. In case of getting wet, these shirts have fast drying property for quick dry. Darker colors: Dark colors get warmer in sunlight and speed up the evaporation. Synthetic fabric: Both Polyester and Nylon are good at wicking moisture, and also it dries more rapidly. Thinner Fabric: Thinner synthetic fabric makes them lightweight and dry much faster than standard cotton. We have researched on best fishing shirts and made a list of ten out of them. Here, we have explained everything that you need to know about fishing shirts. We hope, our recommended fishing shirts list will help you to pick the best one for your next fishing trip. Wearing any of these shirts, you will not only look good but also remain protected from the natural calamities while reeling. 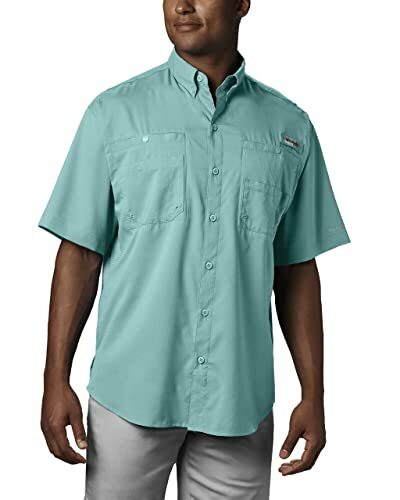 Columbia Men’s PFG Bahama II is a durable shirt which is designed for the needs of anglers. 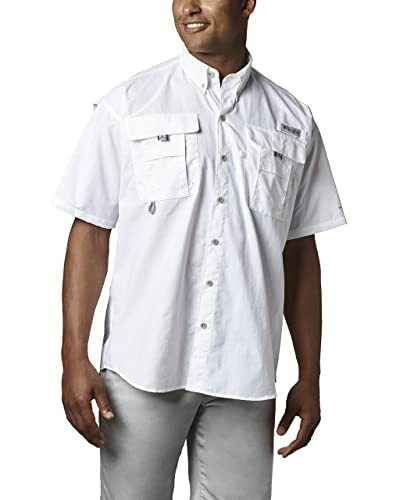 This lightweight nylon made shirt keep you cool and UV protected while you go out fishing. It provides the greatest protection in the sun for long hours and also dries fast as well. It comes with mesh lined hidden shoulder cape vents to provide breathability at the back shoulder. The relaxed fit design of this fishing shirt allows a comfortable fit for all day long. The Omni-shade UPF 30 fabric blocks UBA and UVA ray to prevent sunburn and longter skin damage for long hours in the sun. 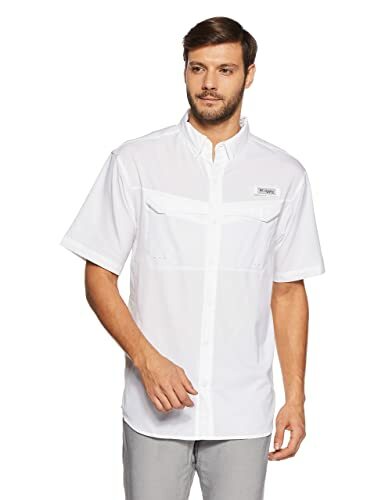 This 100% Tactel nylon men’s shirt features two handy chest pockets with Velcro closure and hidden vents at the shoulder for convenient use. The short sleeve shirt offers a relaxed and lightweight fit that ensures maximum comfort during fishing activities. It can be your ultimate accessory for your day out on the water. Hanes is one of the USA’s no. 1 brand of family basics. Since 1901, it is America’s first name in comfort for clothing such as- shirts, underwear, socks and more. Hanes Men’s Long Sleeve Cool Dri T-Shirt is a rapid dry 50+ UPF rating t-shirt that shields against harmful UV ray and provides protection very well. It’s 100% performing polyester with an interlock knit wicks away moisture and dries remarkably fast to keep you cool and comfortable as well. This popular t-shirt with tag-free collar is contemporary fit to anybody. The double needle stitching on sleeves, neck and bottom hem added great durability to it. 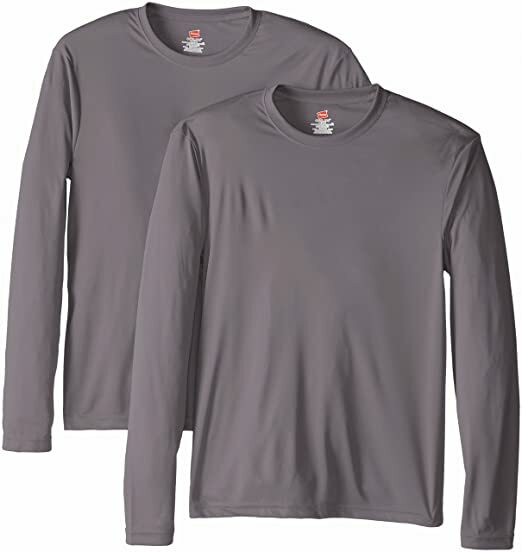 Hanes Men’s Long Sleeve Tee is equally protective and comfortable enough at an affordable price. So, if you are used to going for any outdoor activity like fishing, biking, and hiking, you will find this shirt as perfect clothing indeed. Again, you can even also wear this shirt when you are in the pool or at a beach as well. It also offers a various color option in different sizes to choose. Durable in performance and comfortable to wear. Best suited for fishing, biking, and hiking, even in the pool or sea beach. Columbia manufactures best quality sportswear and outerwear such as shirts, jackets, pants, shoes and many more wear and clothing that satisfied all the demand of its customers. Columbia Men’s bonehead short-sleeve shirt is made in a way to meet all the needs of the active anglers. This fishing shirt offers such features such as- a tool holder, a rod holder, hook and loop closed fly box pockets and utility loop that facilitates you to keep free your hands while working with lines and lures. This cool shirt constructed with soft cotton poplin keeps you cool and comfortable. The breathable mesh-lined cape vents allow airflow at the back shoulder and the hook and loop also let you turn the collar up to keep the sun off at the neck. This shirts with all fishermen-friendly features provide generous fit and hot-weather comfort for a full spectrum of movement. Though this short sleeve lightweight shirt is made for anglers, this is a perfect addition for any active day in outdoor. It comes in various colors and different sizes also. Southern Fin Apparel brings high-quality, authentic fishing apparel along with original artwork from a local brand of South Florida and creates a brand like no other. 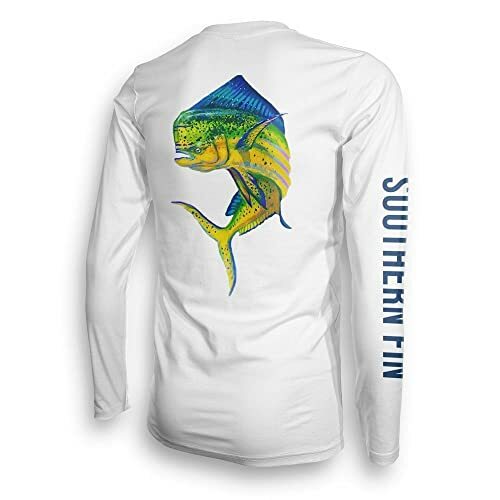 Southern Fin Apparel long sleeve is one of the smartest fishing t-shirts which artwork and design should make you own it. The lightweight design of this t-shirt offers excellent comfort and keeps you dry all the times. This fishing shirt provides you the touch and feels that you have ever looked for when you out on the lake for the day. The UPF 50+ sun protection keeps you free from worrying for becoming too sweaty and getting sunburned. This high-quality unisex shirt made of 100% microfiber dri-fit material wicks sweat away and keep you cool by using moisture-wicking technology. This shirt that comes in XS and 3XL sizes is a perfect gift for any avid fisherman to avoid sitting in sweat all day. Anyone who loves fishing and found fishing as a way of life uses this soft fabric shirt to protect them from harmful consequences of sun exposure that ruin a fishing trip. This quality gift from Southern Fin Apparel comes in 7 different color and patterns to help you enjoy the fishing to the fullest. Columbia fishing apparel has much variety than your thought. Columbia Tamiami li Ss shirt is another unique shirt from Columbia which is able to make the day of anglers. This is made of 100% polyester which provides UPF 40 sun protection. The Omni-wick moisture management system uses antimicrobial material to prevent fungi, bacteria and another kind of gross microbes. The pockets make it more useful to carry further accessories that you need for your fishing trip. These pockets are ideal for holding gear, smartphone, tackle and allow hands-free fishing as well. It has an additional feature to keep itself fresh and odor-free over multi-day trips. Mesh-lined cape vents at the back shoulder allow maximum airflow for relaxing and breathable comfort. This shirt with plenty of stretches enhances the range of motion very well. This lightweight and comfortable shirt also dry very first indeed. Columbia Men’s Low Drag Offshore Sleeve shirt is another useful fishing attire of Columbia which is uniquely designed for moisture wicking. This short sleeve shirt is giving you some options for getting out to the lake. This men’s shirt with Omni-wick moisture-wicking fabric pulls moisture away from the body and allows airflow through the adjustable vented back. Thus, the sweat can evaporate quickly when sitting around waiting for a bite. And so, anglers call it offshore as well. 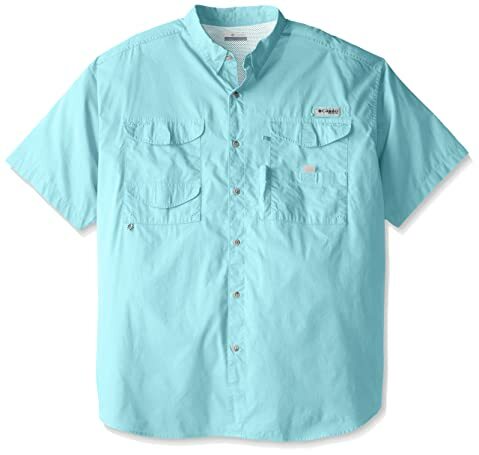 After all, this offshore short sleeve shirt is a great piece among the wide range of Columbia products on fishing gears. Columbia Men’s Low Drag Offshore shirt is vented on sides and back for adjustable comfort. This 100% polyester fishing shirt with UPF 40 sun protection and quick dry feature kept you relaxed and protected out on the water. It comes with two pockets and rod holder on chest. The lightweight and subtle design of the shirt looks sharp in the sun and also ideal for any situation. The antimicrobial properties keep this shirt fresh even after multiple wearing. As we know, Columbia is a venerable sportswear company that put out various fishing shirts which are very reasonably priced. Columbia Sportswear Men’s Bonehead long sleeve shirt provides all the features same as Columbia Men’s bonehead short-sleeve work shirt. The main difference between these shirts is in the sleeves. Whether Columbia Men’s bonehead work shirt has short-sleeves, whereas Columbia sportswear men’s bonehead comes with long-sleeves as well. This is also a quality product likes other fishing shirts of Columbia. This is the last fishing shirt in our list from Columbia and anglers who prefer long-sleeve shirt during fishing can have this shirt undoubtedly. 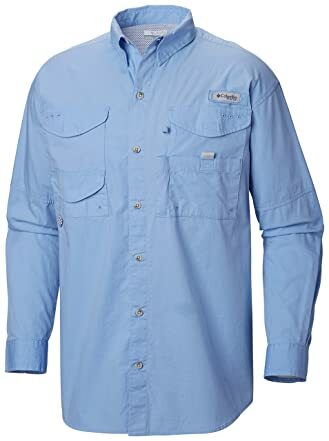 Columbia Sportswear Men’s Bonehead Long Sleeve Shirt is made of 100% cotton poplin that delivers a relaxed fit and style for active anglers and also ensures ultimate protection as well. This shirt provides a button at the sleeves to convert the long sleeves into short. It comes with four hook and loop closure fly box chest pockets and also a rod holder at the left chest which makes it convenient to use for active fishing days. This lightweight men’s fishing shirt with mesh-lined back vent has both breathability and relaxed fit indeed. This is a perfect addition for active anglers to go for a busy day outside. AFTCO stand for American Fishing Tackle Company, has an age-old tradition for leading fishing tackle and clothing. It works for protecting our fishing resources and takes great pride in its tradition. AFTCO Jigfish long sleeve UPF 50 standard shirt provides ultimate protection and prevent the harmful effects of the suns UV rays. Its 100% polyester moisture wicking fabric can block 98% of UV rays to keep you calm and dry in the sun without using any heavy layers. The shirt comes with AFTCO fish logo on the chest, AFTCO logo on left arm and Marlin Puzzle logo on back. This lightweight shirt with high-quality construction and stitching lasts more than expectation. Yet, this is one of the best fishing shirts among the fishing shirts available in the market. 28 palms manufacture 100% machine washable shirts made of premium materials like 100% silk and linen. 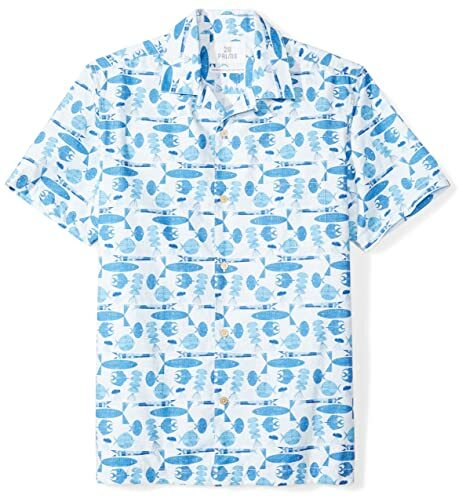 This Amazon brand produces casual aloha shirts with a vibrant print and breezy cotton to add tropical appeal for the beach or out of the office style. Tropical Hawaiian shirt made of lived-in fabrics let you get away from everyday style and provides easy to wear fit as well. This out of office style shirt ensures perfect relaxation for every man very well. If you want to take a vacation from your everyday casual shirts, then you must try this unique carefree colored shirt from 28 Palms to get beach feeling even in your backyard. This fishing shirt features left chest pocket, coconut buttons, spread collar and straight hem with side vents. The standard fit provided enough room in the chest and tapered through the waist for a tailored silhouette. This lightweight tropical print shirt comes in various color and print as well. 28 Palms Tropical Hawaiian is a sunshine-ready shirt which is best suited for vacation and staycation indeed. Piscifun is a well-known professional brand for manufacturing fishing gear over 20 years. This best buy fishing tackle brand on Amazon manufactures high-end fishing accessories like baitcasting reels, spinning reels, fishing lines, tackle bags, etc. 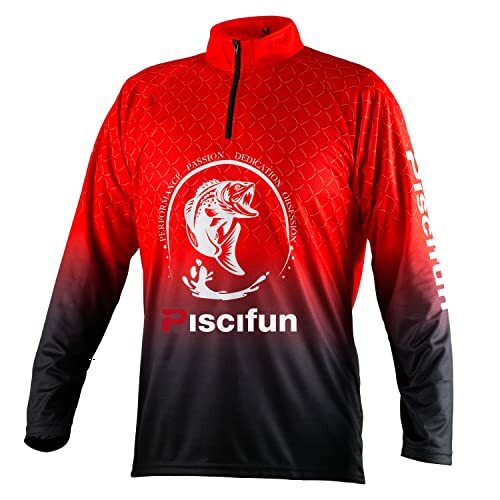 Piscifun exactly knows what fishers need in a fishing shirt and so, they have specifically designed shirts for fishing which are available in the market. It offers some best fishing shirts to keep you cool and protected in the sun during fishing as well. Piscifun performance UPF long sleeve fishing t-shirt is one of the best fishing t-shirts for its outstanding features and inexpensive price. This is lightweight and comfortable enough to keep you cool and protected whenever you are on the boat or at sea beach. Silky soft pure polyester construction provides both freedom of movement and UPF sun protection very well. Omni-shade UPF 30 standard ensures protection against harmful sun rays during the long hour in the blazing sun. It comes with only two color option (red and blue) and a little variety of sizes. The lightweight construction dries quickly and also breaths well indeed. This is a perfect fishing shirt for both indoor and outdoor sports such-fishing, cycling, golf, riding, boating, soccer, racquetball, etc. So, if you want to look cool in both indoor or outdoor sports activities then buy and join Piscifun with other 60,000 buyers. A smart choice of a fishing shirt gives many happy experiences during your fishing expeditions. All avid anglers know that proper fishing attire is a vital fishing accessory like other fishing gear. A perfect fishing shirt not only protects from sunshine but also makes you look cool as well. So, it is essential to consider weather conditions, fishing environment, and personal preferences before choosing a fishing shirt. All the fishing shirts reviewed above are stylish and comfortable indeed. To ensure your fishing success, go through this review and select the best fishing shirt among them that fits your fishing needs and conditions very well. Hope your choice will become lucky for your fishing as well.